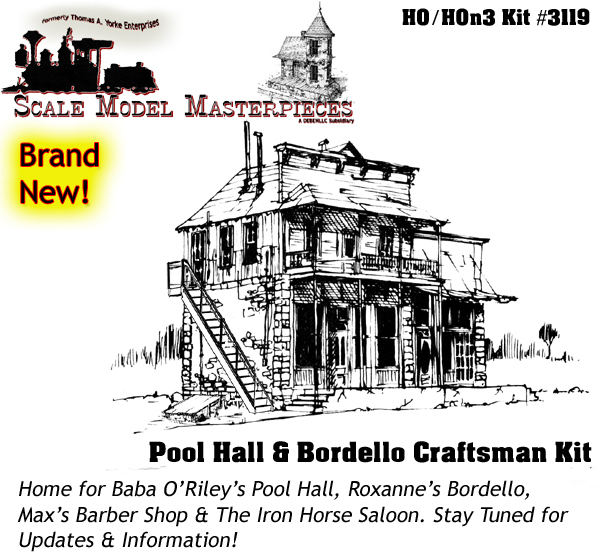 Welcome to “Scale Model Masterpieces - Details Parts (Z, N, HO, S & O Scale”. This is where we now offer re-introduction of most, if not all of the Thomas A Yorke Ent., Doctor Ben's Scale Products, and Cal Freight HO Scale Details and Accessories. Assimilating all of these product lines has been a long and arduous process due to the complexities of identifying the Thomas Yorke Ent product line as well as developing the products all the while managing day-to-day business such as our extremely popular Doctor Ben's Scale Consortium Weathering and Scratchbuilding product line. Select a scale by clicking on the above Links. There you will find the Scale Sub-Catagories as well as the opportunity to download and print a pdf document of the Product List for that Scale. FYI You may find next to some kit titles, the phrase, 'New-Old-Stock' or NOS. Both of these terms means that this may be an 'original Thomas A Yorke Enterprises or other brand kit that we have had to purchase to verify the contents as previously described, and then when possible make a few, if needed updates and then since we have what we needed, we then sell the kit. Heck, sometimes we update and reprint the instructions as well as labels. As always we try to be as honest and up front with you so that you have no surprises when you receive your purchase.